Die Hard: With A Vengeance on VHS. Starring Bruce Willis, Jeremy Irons, Samuel L. Jackson. With Graham Greene, Colleen Camp. Directed by John McTiernan. 1995. 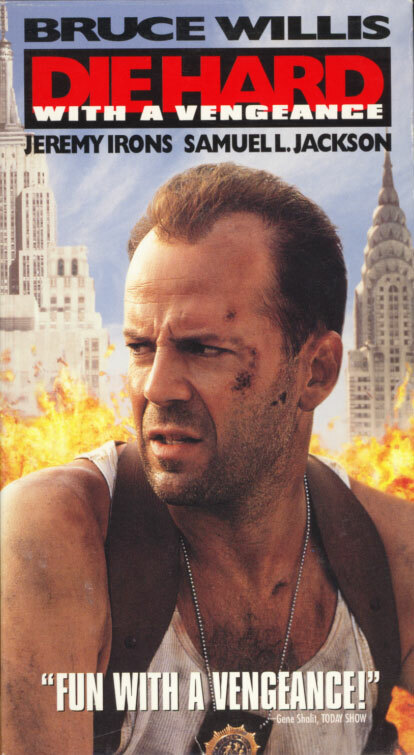 This time, New York cop, Jon McClane (Bruce Willis) is the personal target of mysterious Simon (Jeremy Irons), a terrorist determined to blow up the entire city if he doesn’t get what he wants. Accompanied by an unwilling civilian partner (Samuel L. Jackson), McClane careens wildly from one end of New York City to the other as he struggles to keep up with Simon’s deadly game. It’s a battle of wits between a psychopathic genius and a heroic cop who once again finds himself having a really bad day.